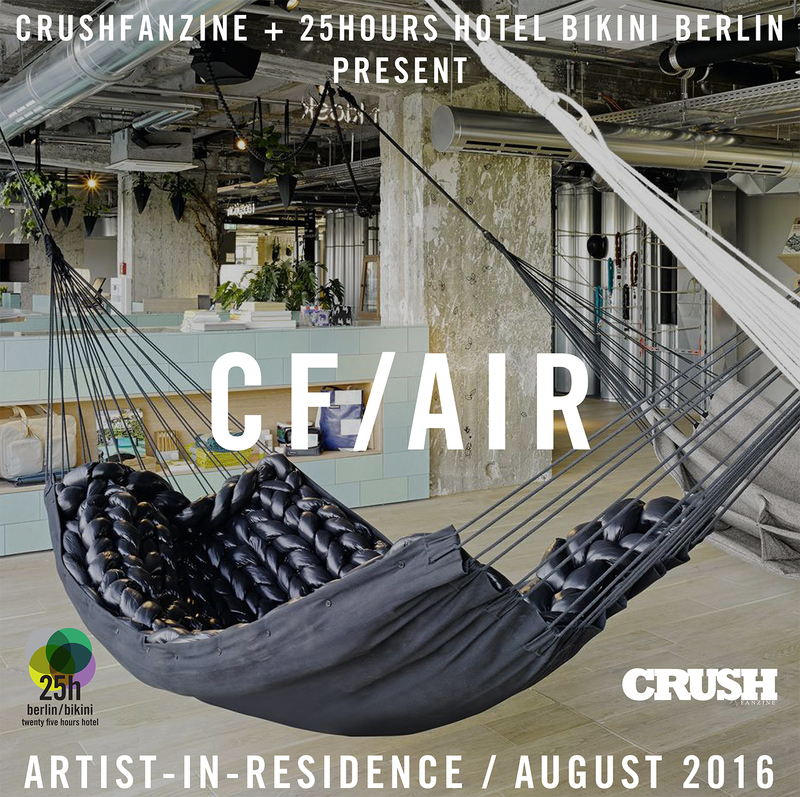 In partnership with 25hours Hotel, CRUSHfanzine is pleased to announce its Artist-in-Residence program. 0) A brief letter from the writer explaining how his stay at 25hours Hotel Bikini Berlin would benefit his or her work. 5) During your stay, we ask for a daily photo to document your experience and writing process. 6) At end of stay, we ask you to provide a short story about a character that would have stayed in your room within the past or future.Writers may also submit samples of previous work. This is optional. Samples should not exceed 10 pages total. The residency is open to all short story fiction writers. All submissions are due July 15, 2016 and must be in English or include an English translation. Continental breakfast, lunch and dinner will be provided daily free of charge; all additional incidental charges (room service, etc.) will be incurred by the guest. All rooms are nonsmoking. It is expected that the writer will stay alone, within reason. CONTEST RULES: NO PURCHASE IS NECESSARY. Void where prohibited by law. Contest is co-sponsored by CRUSHfanzine (CF Media, LLC) and 25hours Hotel Company GmbH. The Contest entry materials will be judged based on craft and creativity and one (1) winner will be chosen among all eligible entries (the “Contest Winner”). Odds of winning will depend on the number of entries. The Contest Winner will receive a one (1) week stay in a suite at 25hours Hotel Company GmbH (along with daily continental breakfast, lunch and dinner) valued at approximately $7,500 total (“Prize”). The Contest Winner will be announced via email by July 15, 2016. No travel expenses will be provided. The Contest Winner must provide a valid credit card for all incidentals. The Prize must take place during the last week of August, 2016. The Prize is non-transferable and is not redeemable for other products, services or monetary value. No refund will be provided, and any portion of the Prize that is not used is forfeited. The Prize is subject to the Hotel’s terms and conditions. By entering into this Contest, Participants grant to CRUSHfanzine and 25hours Hotel Company GmbH an irrevocable, worldwide, royalty-free unrestricted right to use the Participant’s name, hometown, likeness, biographical information, photograph, prize won and any other information provided (excluding the Contest entry materials) (collectively, the “Content”), whether alone or in combination with other materials (including but not limited to text, data, images, photographs, illustrations, and graphics, video or audio segments of any nature) in any advertising, promotion, publicity or merchandising, in any and all languages, formats, and media, now known and later devised, without further permission, review, notice or compensation of any kind. WARRANTY, INDEMNITY AND RELEASE: Participants warrant that their entries are original and that they are the sole and exclusive owner and rights holder of the submitted entries and that they have the right to submit the entries in the Contest. Each Participant agrees not to submit any entry that (1) infringes any third party proprietary rights, intellectual property rights, industrial property rights, personal or moral rights or any other rights, including without limitation, copyright, trademark, patent, trade secret or confidentiality obligations; or (2) otherwise violates applicable law. By entering the Contest, Participants agree, to the fullest extent permitted under applicable law, to release, forever discharge and hold harmless CRUSHfanzine, CF Media, 25hours Hotel Company GmbH and its and their respective Affiliates, advertising and promotional agencies, and each of their owners, directors, officers, employees, agents and representatives (collectively, the “Released Parties”) from and against any and all claims, damages, losses, liabilities, injury or loss to person or property, costs and expenses, suffered by the Released Parties, arising from or relating to Participant’s participation in the Contest, Participant’s acceptance, use or misuse of the Prize, or the Released Parties’ use of the Content, including, without limitation, any claims based on defamation, violation of publicity rights, privacy rights, personality rights, moral rights, or intellectual property rights, including copyright infringement and trademark infringement. Explore more of the 25hours Hotel Bikini Berlin here.